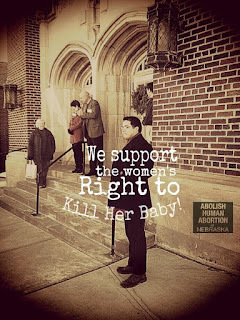 I had the distinct honor of attending the launch of Nebraska's Abolitionist Society and participate in an amazing church protest at First Central Congregational Church in Omaha. Todd Bullis of World Life Organization in Plano, Texas, Grant Keeter from A//A in Norman, Oklahoma, Tim Locklear and yours truly set up a Church Repent display at one of Omaha's oldest churches. In fact, First Central may be so old as to have utterly forgotten what the definition of Christian might be. Our presence brought out numerous congregants in short order and in particular one young man began to engage us about having been a Planned Parenthood volunteer in Oklahoma City. The debate became lively and confusing as he spoke about his husband. 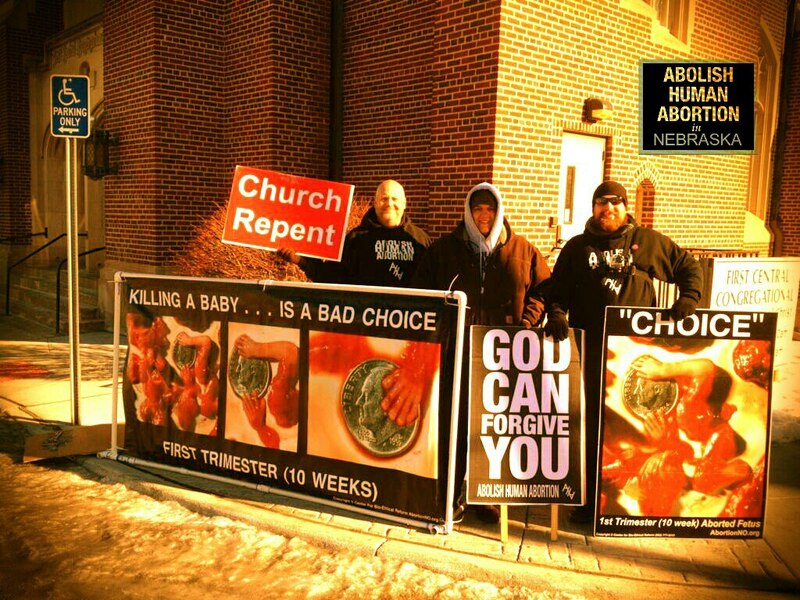 This congregation, with the exception of one black woman, were unashamedly in favor of shedding innocent blood and no amount of persuasion that they are in complete opposition to God's Word, made a dent in their adamant abortion advocacy. cracked open the door behind our display and asked why we were there. We explained that Tim had called the pastor to ask him to stand with A//A Nebraska against the killing of children. Tim told the teen that Rev. Dr. Scott Jones told him absolutely not, that he supports aborting the tiniest among us in their mother's wombs. I wish I'd had my camera ready to capture the crestfallen look that passed across the countenance of this boy as he told us that the pastor is his father. But, no matter, the Planned Parenthood volunteer member ran out and admonished us to post no photos of the teen to any social media because he's a foster child. He claimed it would be illegal to post a photo of a ward of the state. As the protest continued and the members began to straggle out, more and more of their confused theology was revealed and also the information that Scott Jones is the "husband" of the Planned Parenthood volunteer. Confused yet? I don't blame you, but to clarify, the pastor of this historic Omaha church is homosexual and the foster parent of a teen aged boy and they promote the destruction of innocent lives. What is wrong with our laws and our churches that this cultural chaos seems normal ? Almost to a person, the congregants wore syrupy smiles as they tried to pretend that nothing is wrong with this picture. Clearly A//A Nebraska has its work cut out for it and Praise Almighty God that they are involved with people who are on fire for the Gospel of Life and changing a culture that kills her posterity. 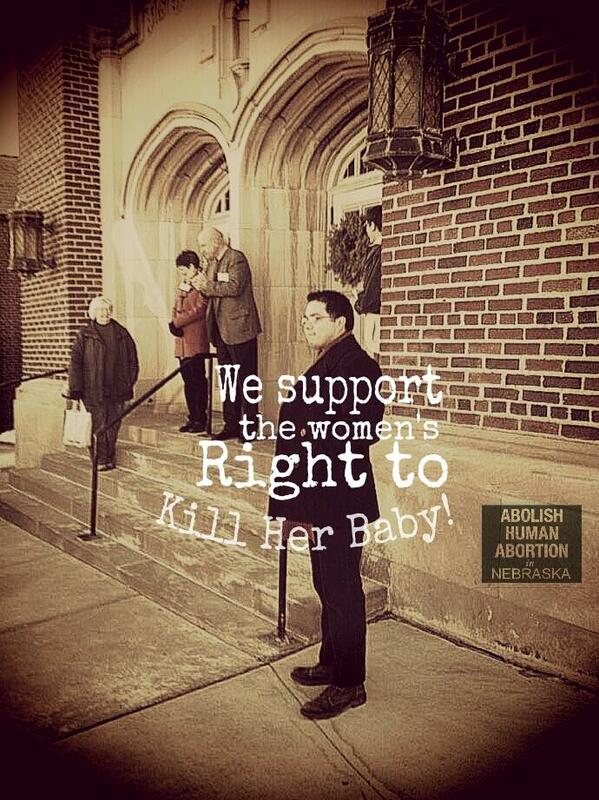 As A//A Nebraska's Tim Locklear says, "I can do nothing less than be an Abolitionist as a Christian in a culture that kills children"
What is your church doing to end the war on pre-born children?